Former House Speaker Newt Gingrich really should consider updating the mailing list for his conservative American Solutions organization. To the delight of The Lodge, which modestly bills itself as "America's best-known and most-honored gentlemen's club," Gingrich again is asking owner Dawn Rizos for money. This didn't go so well the first time around. As documented on this website, National Public Radio, MSNBC's Rachel Maddow Show and numerous other news outlets, American Solutions last year offered to name Rizos one of its Entrepreneurs of the Year in return for a $5,000 donation. She was supposed to receive the honor during a private dinner in Washington, D.C.
Rizos sent the money, but belatedly was spurned by Gingrich after his people discovered that the Dallas-based Lodge specializes in picturesque, scantily-clad women. 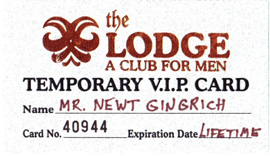 The Lodge instead used the returned check to open Newt's Nook, a recovery center for sick and injured dogs. They weren't the only ones to howl, with Maddow in particular having a field day and interviewing both Rizos and "writer in residence" Michael Precker on her show. American Solutions now is asking Rizos for a suggested $1,000 donation -- "or even as much as $2,000" -- to become a card-carrying member of the organization. A copy of her 2011 membership card, affixed with both Gingrich's and Rizos' name, is attached to the two-page come-on. "After the resounding rejection of Barack Obama's leftist ideology and governing policies on November 2nd, we stand on the verge of an exciting new era," the solicitation letter says. "Thanks to members like you, American Solutions played a critical role in helping create this year's sea-change election." ***Access to The Loft, our intimate members-only lounge with your personal concierge, and to the Wine Cellar. ***Complimentary admission at all times for you and your guests. ***A free steak-and-lobster lunch every Thursday, with the purchase of any two beverages. ***Invitations to our remarkable theme parties, which include feature entertainers, an elaborate gourmet buffet, and $2 drinks. Rizos says The Lodge is expecting "huge crowds" during Super Bowl XLV week, but "I guarantee we will save a table for Newt." Meanwhile, the conservative mover and shaker continues to be the gift that keeps on giving. 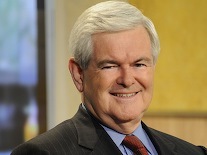 And The Lodge again is overjoyed to again be on the receiving end of Gingrich's latest shakedown.